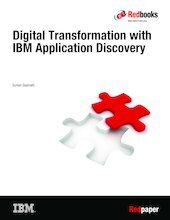 This IBM® Redpaper™ publication describes how IBM Application Discovery (AD) complements IBM z/OS® Connect Enterprise Edition and IBM Developer for z Systems® in making older mainframe applications available to the digital world. By using a sample scenario, this publication primarily focuses on how the functionality of AD can be used to discover application programming interface (API) candidates and how z/OS Connect can easily create an API out of the mainframe program. It also describes how IBM Developer for z Systems acts as the tool that links the entire transformation.